Highly Absorbent, Super Soft, Non-Scratch. 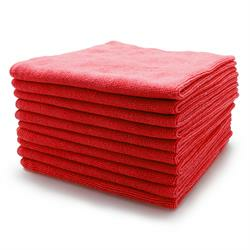 Microfibre cloths are a vital detailing commodity. The UF Non-Scratch microfibre cloths have a 300gsm weight composed of a genuine 30% polyamide, so will not introduce scratches or marring to even the softest of paint finishes. The other 70% is polyester for high strength and durability. As a result, these high quality microfibres are the ideal all-purpose cloths for the busy detailer and the car care enthusiast alike. Available in 3 colours, singles & cost effective 10 packs - view the full range here. Composition: 70% Polyester (for strength), 30% Polyamide (for softness). Great for the price, I use these for everything. These are a fantastic bulk buy, I’ve tried “plush” microfibres from other companies but they just don’t have any “bite” for tougher waxes, so I always end up going back to these. The yellow Meg’s microfibres used to be my favourite but at twice the price they just aren't worth it compared to these, these just work, plain and simple. They’re not too big either so there’s less risk of a corner dragging on the ground. I have bought few packs (10x) of these cloths and will buy more next time. I use it for everything as universal microfiber cloth. Some of clothes went through more than 20 washes and still are feeling like new. It is hard to say something special about simple microfiber, but all in all it is a great product because of durability. I have tried many microfibres cloths as I am sure lots of UF customers have. Having read the details about the UF microfibres cloths I purchased 2 packs of 10, red and black. When they arrived they felt a much better quality than those I had already, and performed beautifully when I used them on my car. However, where they showed their superiority over the other brands I had tried was when they were washed. THEY LOOKED AND FELT AS IF THEY WERE BRAND NEW AGAIN. The pile was still high and they felt really soft to touch. I have used and washed them many times now and they are still looking, feeling and performing great. A great product and highly recommended.